This Saturday sees the start of the William Hill Scottish Cup with the first preliminary round matches taking place with the winners of the Scottish Amateur Cup taking part for the first time. Last season’s Scottish Amateur Cup winners was Harestanes and they have been given a home draw against Ayrshire Junior side Girvan for a tie that could well produce an interesting result. Golspie Sutherland meet Highland League side Cove Rangers with the away side starting as strong favourites to progress. There are three local South of Scotland League Clubs involved in this round with two of them receiving home draws and the other being drawn away. Newton Stewart travel to Edinburgh to play East of Scotland League side Civil Service Strollers at the College Grounds and will have to be at their very best if they are to take anything from this contest. On the other hand, Wigtown and Bladnoch could do really well against East of Scotland side Vale of Leithen at Tramondford Park and St Cuthbert Wanderers will start as favourites to progress at the expense of Burntisland Shipyard. Newton Stewart, St Cuthbert Wanderers and Wigtown and Bladnoch are wished all the best as they fly the flag for South football. 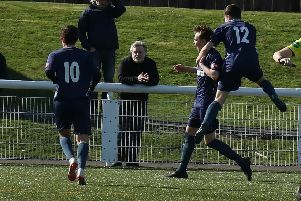 On the home front there are five South of Scotland matches scheduled to be played with Heston Rovers having the opportunity to go to the top of the table if they can take the points from their match against Upper Annandale at Palmerston Park. Heston are still unbeaten this season and there is nothing to suggest that this will change by the end of this encounter. Edusport Academy travel to play Creetown at Castle Cary Park and will be strong favourites to take the three points while Abbey Vale should also record a victory in their match against Dumfries YMCA. Fleet Star play hosts to Crichton at Garries Park, Gatehouse for a match that could well go close although the experienced visitors could well be the happier of the two teams come the end of this contest. Mid-Annandale entertain Lochar Thistle at Lockerbie for another match that could be very evenly matched although the visitors could well have the edge to take the points if they can stop prolific goal scorer Nathan Muir from hitting the net. However if an in form Muir continues with his constancy of scoring goals then Mids are more than capable of pulling off a positive result. South football continues midweek when Newton Stewart entertain St Cuthbert Wanderers at Blairmount Park with a 7.30pm kick-off in a league match. Saints have assembled a strong and experienced side while the Creesiders have introduced several inexperienced youngsters from Galloway Thistle Youth Club into their ranks as they build for the future. Saints will start as favourites to continue their good run of form but to do so they may well have to be at their best. There are another six matches being played on Wednesday evening with Lochar Thistle and Heston Rovers locking horns in a local derby for a match that could go either way. Edusport Academy are again on their travels when they visit Gatehouse to play Fleet Star while Crichton are expected to take the three points from their match against Dumfries YMCA at Hospital Park. Abbey Vale entertain Nithsdale Wanderers at Dumfries High School for what looks like an evenly matched contest and in the Annandale clash between Uppers and Mids, the visitors may just have the edge. Wigtown and Bladnoch are expected to take the three points from their local derby match against Creetown at Trammondford Park although the young visiting side will as usual fight all the way to try and take something positive from this encounter.